Who should not take Feraheme Vial? This medicine is used to treat "iron-poor" blood (anemia) in people with long-term kidney disease. It is a form of iron that must be given by injection. You may need extra iron because of blood loss during kidney dialysis treatment. Iron is an important part of your red blood cells and is needed to carry oxygen throughout the body. Many patients with kidney disease cannot get enough iron from food and require injections. What conditions does Feraheme Vial treat? Tell your doctor right away if any of these unlikely but serious side effects occur: unusual bruising, skin darkens (bronze tone), swelling of hands/feet/lower legs, chest pain. List Feraheme Vial side effects by likelihood and severity. Before taking ferumoxytol, tell your doctor or pharmacist if you are allergic to it; or if you have had a reaction to other types of injectable iron; or if you have any other allergies. This product may contain inactive ingredients, which can cause allergic reactions or other problems. Talk to your pharmacist for more details. What should I know regarding pregnancy, nursing and administering Feraheme Vial to children or the elderly? Some products that may interact with this drug include: other iron products. 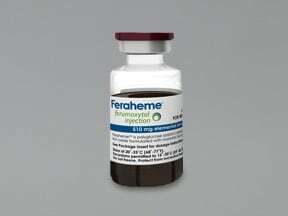 Are you taking Feraheme Vial? 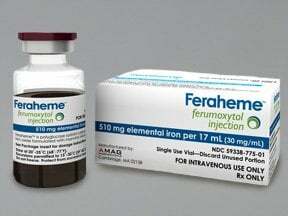 Are you considering switching to Feraheme Vial? How long have you been taking Feraheme Vial?